In the first 48 hours following his surgery to remove a fatty pad, Brisby, Nature’s Perfect Schnoodle, exhibited that remarkable stoicism common among dogs. At 11 years old, Brisby is our dog that breaks the most. And as with older dogs, it is increasingly difficult to find replacement parts for him. Brisby has had several benign fatty pads, or lipomas, which is Latin for “Costly”. However, one grew quickly and was located in a bad area – behind the old, abandoned warehouse down by the docks. Removal was recommended by our veterinarian who has treated Brisby since he was a puppy. That is, since the dog was a puppy, not the doctor. Our vet is human, as near as medical science has been able to determine. Although Brisby’s surgery was scheduled for 1 p.m., our vet had us bring him in at eight in the morning. Brisby spent the hours filling out complicated HIPAA forms and grumbling about his roommate, a gloomy Rottweiler with sleep apnea who complained constantly that his kids never visit. Post-operative care for dogs differs for each pet. However, usually animals are discharged with an informative list of instructions, a recovery cone, and a satchel of drugs that would get them arrested at any airport. Probably by a trained sniffer dog. Know what to expect as your pet recovers. Your dog will be sleepy and lethargic for 12 to 24 hours after surgery. Then for another 10 to 15 years after that. The latter has nothing to do with recovery. Dogs just really like to sleep. However, to promote proper healing of tissue it’s best to restrict your dog’s activity in the immediate days after surgery. To enforce rest, some dogs require confinement. Others are satisfied binge watching Netflix or, in rare cases, HBO. Avoid documentaries, especially about drug arrests at airports. Dispensing post-op medications that the sniffer dog missed. If considering home remedies, discuss first with your veterinarian to determine their efficacy. Meditation, for example, might appear to balance your dog’s chakras, but honestly, she’s just asleep. Caring for the surgical incision without throwing up. While a “hands off” approach to the healing incision is best, keep it under close scrutiny so it doesn’t go all Walking Dead on you. Left unsupervised, dogs will bite, scratch, and especially lick the incision. Licking, of course, is what dogs believe they were hired to do. In fact, dogs are nothing more than long tongues surrounded by a large, furry delivery system that also poops. 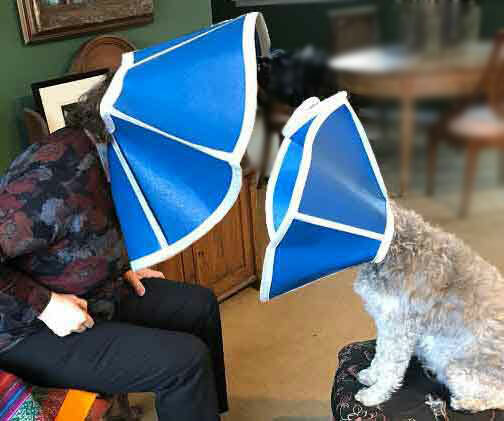 Preventing dogs from licking, and thereby infecting, the healing wound is the job of the humorously named “Cone of Shame.” Yet that and similar devices do more than protect cartoon dogs for later movie sequels. They also prevent your dog from seeing where he’s peeing, which adds another level of humor although not as funny as the dog-riding monkey. Avoid other dogs. Especially if you own other dogs. Sooner than later, your dog will want to get back to his important job of licking things. But he might not be ready, so limit his work. For example, encourage him to telecommute from home depending on the length of his tongue. Unfortunately, another dog in the home can add disruptive urgency to the patient’s slow, steady recovery. So glad Brisby is recovering! And so glad your first 2018 post is as hilarious as ever. By the way, I’ve had several cones of shames—of the pistachio gelato variety—which have greatly contributed to the two big fatty pads I sit on. How we suffer for our puppy dogs! Armani jacket lining? Puleeze! Taking my fur-baby next month to be neutered and have dew-claws removed. The neuter is necessary, but I’ve agonized about the dew claws to the point where my friends are avoiding me. I’m already dreaming up the ways I will baby him when he comes home from his surgery and worrying about all the things that could go wrong. Thanks for helping me gain a little perspective! Oh Cara, fur-baby’s gonna be fine! But I sympathize. Like many terriers, Budleigh hates having his nails trimmed the way an organized crime figure hates riding with an unknown chauffeur. Once when our veterinarian tech took Budleigh in back, I swear I could hear him whimpering. Turned out that was a Spaniel mix in the hall demanding treats from the receptionist. Budleigh exited later, chipper, cocky, and demanding some of those treats he’d heard so much about. Had to change to another vet. Mine was wearing a cone. Turns out he was a vampire. Such an enjoyable read, especially while my Jake is healing from his leg surgery. His Giant, not being as good as your dog’s, was suckered into believing that the Cone of Shame was preventing Jake from his med school graduation. Cone removed, under direct supervision, Jake proved he could remove sutures quickly but not so effectively. A two week stay in the cone is now a 4 week! Love your column/blog! Thank you, Debra. Our best to Jake for a speedy recovery. Please give him a nice, long scratch for us. Ideally not near the sutures.